The McDonnell F3H-2 Demon shared the unfortunate fate of an entire late Fifties/early Sixties generation of pace-setting Navy fighter designs doomed to short operational lives by the failure of Westinghouse jet engines to produce promised thrust and reliability. 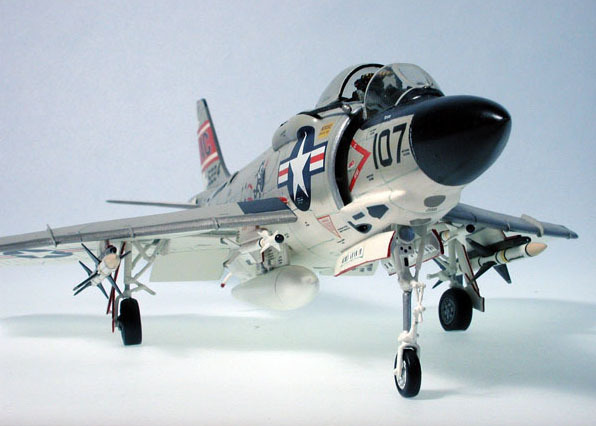 The extremely poor reputation of these powerplants resulted in Westinghouse abandoning the aircraft engine business, but although the Demon soldiered on only 'til 1964 with the replacement J-71 engine, the airframe's design concepts were already evolving into what would soon be the fighter standard of the world for the next twenty years, the F-4. 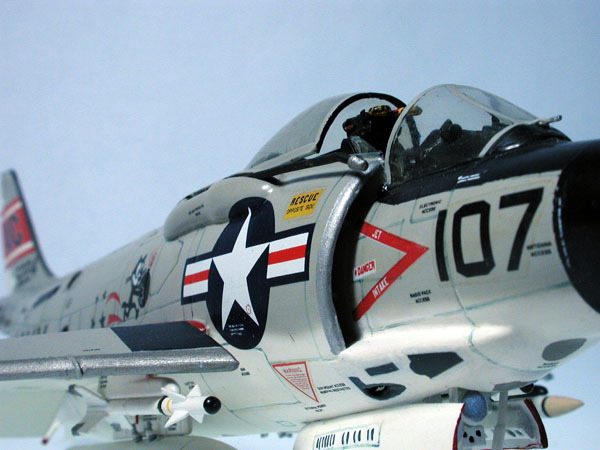 The absence of a quality 1/48 Demon--the vac Comet "whip model" doesn't count, and the Collect-Aire resin kit was released later than our subject kit--was, until about five years ago, a glaring gap in U.S. Naval aircraft between WWII and Vietnam. Accordingly, Bondo was ecstatic when Golden Wings in the U.K. came to the rescue with a very nice multimedia release; saved again by vacuform! Molding is quite decent, akin to that of Aeroclub, albeit with relatively thin plastic. Engraving is less delicate than, say, Dynavector, but still acceptable. White metal parts were numerous, and also of acceptable, if plain, quality. Fate smiled further when Eagles Talon announced a most helpful $27 resin detail set for the Demon, including the cockpit, seat, afterburner nozzle and air refueling pod and boom. 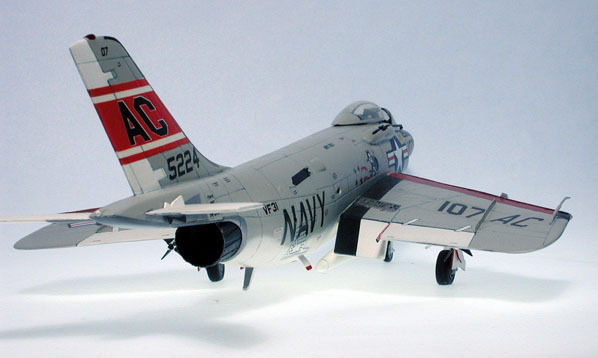 I was dissatisfied with the shape of the vac radome and substituted one from a spare F-4C/D kit. The kit's metal burner nozzle was too small, and the resin one from Eagles Talon bit the dust also, in favor of, again, a larger one from an F-4 kit. Although the sawtooth-edged, perforated spoilers are molded into the wing, I didn't care to conduct a 'practice bleeding' session to painstakingly remove those sawtooth edges and do all the necessary detailing to display the spoilers deployed. Even so, their steel metallic finish helps to contrast with the large expanse of gull gray. In retrospect, I do wish I had taken time to cut out and detail the speedbrakes. I guess I was just too tired to have to punch all those air holes! Scratchbuilt details were also added. Slats were cut out of the wing leading edges, and the slat nesting area created out of F-111 wing leading edges. One reason I like to do slats on this era of naval birds is not only for the "busy-ness" factor, but also for the great color contrast between the red undersurfaces and the gull gray/white overall scheme. 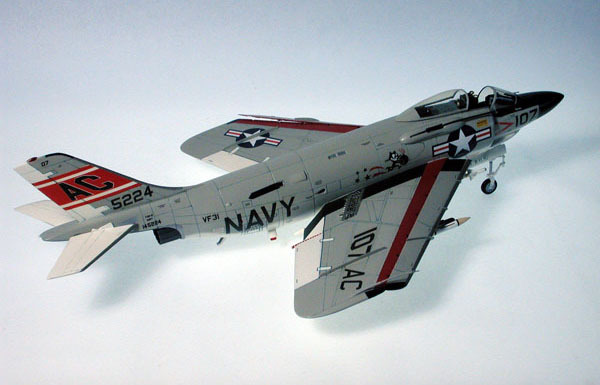 Flaps were dropped, antennas, dump masts added and the structural area behind the seat detailed per drawings and pix in the excellent--virtually a requirement when doing older navy birds--"Naval Fighter" Demon volume by Steve Ginter. Unit markings are from the Golden Wings decal sheet and are those of the famous VF 31, "Felix the Cat." National insignia was from a Superscale sheet, as are various stencils. The landing gear was done OOB, with the only caveat being that the soft white metal flat strut portion onto which the main gear axles are molded tends to bend with the passage of time, making the wheels slowly assume negative camber. I've had to bend 'em back numerous times, and I'm afraid they'll soon 'work harden' and break. Although Bondo is a retired recce/Vark "puke," I've always been enchanted with older generations of naval fighters, especially so with the Demon. I am therefore so grateful that there are small firms out there willing to take the road less travelled while the Tamiyagawa Empire bean counters consider which Me-109 version to do next. Use the "Back" arrow of your browser to return to this page.